Who are the Masters of the seven rays? What is a chohan? How is the Christ consciousness expressed in the seven rays? How do the chakras relate to the rays? What are some past lives of these masters? What were some of El Morya's previous embodiments? Could you tell us more about the Masters of the seven rays? In this age of gurus and masters and teachers, I think it's important to realize that there are truly those who have mastered time and space and who have followed the disciplines of the path of the Christ and the Buddha and who have become one with the eternal light. 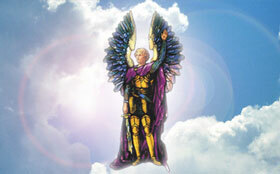 These Masters are called the Ascended Masters because they have reunited with God in the ritual of the ascension. The ascension is merely the acceleration of the vibratory rate of the electrons and the actual nuclei of the atoms of being until the vibration is so intensified that the individual actually disappears from the sight or the visible spectrum of the disciples. Jesus was not the only son of God who ascended into the white fire core or the central sun of being. There have been many sons and daughters of God both before and after his birth who have attained to this oneness. These sons and daughters of God are our brothers and sisters on the Path. They are not exceptions to the rule but they are the personification of the rule, or the Logos, or the Word of God itself. They have had the same resources that we have—a threefold flame of the Trinity within the heart; a Real Self, who is the anointed one, the Christ, the Buddha; and an I AM Presence, whom Moses saw in the bush that burned but was not consumed. These ascended masters have become authorities through their own disciplines and through following one of the rays of God they have become the Chohan, or the Lord, of that ray. They stand as the way-showers, or the teachers, who show their disciples the path back to the center of their own being through that particular ray. The Chohans have come to teach us what is the true teaching of Christ for our particular ray. 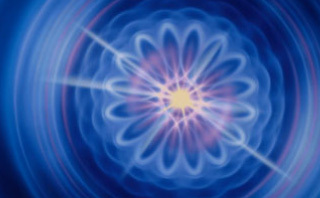 Each of the seven rays that is the fulfillment of an aspect of the Christ consciousness is ensouled by an Ascended Master who has graduated from the schoolrooms of earth, ascended into the Presence of the I AM THAT I AM and stands as the teacher of the way of self-mastery on a particular ray, or radiance, of the Christ mind. And so as Chohan of the First Ray, I teach the law of the will of God and the mastery of energy through the throat chakra in the science of the spoken Word. 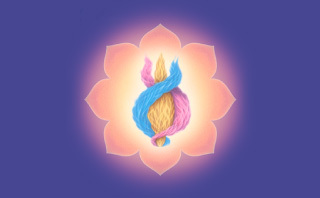 Lord Lanto, the Master of Wisdom who taught wisdom's way in ancient China, teaches the path of attainment through enlightenment, definition and dominion in the crown chakra. You see, the crown chakra is the center for the mind of God even as the throat chakra is the center of the will of God. These Chohans, as Lords of the rays, guide us in the mastery of each of the seven rays through each of the seven chakras. Paul the Venetian, who was embodied as the Italian artist Paolo Veronese, is the Lord of the Third Ray of divine love. His chelas learn the art of keeping the flame through the discipline of love and the mastery of the flow of creative forces through the heart chakra. The Chohan of the Fourth Ray is the Master Serapis Bey—a Spartan if I ever saw one -whose fiery determination has saved many a soul from the mush of self-indulgence. His chelas reflect the fierceness of their Master as they are immovable in their dedication to purity focused as the Mother light in the base-of-the-spine chakra. 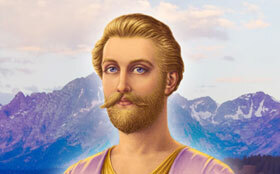 Hilarion, devotee of truth and scientist of the New Age, was embodied as Saint Paul. As Chohan of the Fifth Ray, he reveals the path of mastery through science, truth, healing and the immaculate vision of God through the third-eye chakra. Saint Paul is very much involved in working with atheists and agnostics. He comes to show us that true religion is the highest science and that all religion can be proven if we will accept the proof of that which manifests within as well as that which manifests without. And there is just as much empirical proof of the God within as there is empirical proof of the God without. Beloved Nada, our Lady Chohan who was embodied as a lawyer in defense of cosmic justice, serves as the Lord of the Sixth Ray showing the way of Jesus, the way of humble service and ministration that adorns the talents of others with the rose of selflessness and unlocks their creative potential through the mastery of energy in motion in the solar-plexus chakra. This is why those who serve on the Sixth Ray with Jesus and Nada have an intense feeling for God and a very devotional nature. Their chakra is the solar plexus, which is tied to the water element, the water body, and therefore the feeling for God is very intense. Nada's chelas pave the way for the golden age of Aquarius under [the Master] Saint Germain. The Lord of the Seventh Ray, who is the Master of Alchemy, teaches not only the uses of the energies of freedom and the spirit of liberty but also the way of the alchemical ritual as a necessary component of soul liberation. His ritual is alive with meaning. In his retreat in Transylvania he unveils the symbology of the ritual of the atom and the formulae of the cycles for the release of God's energy in manifestation in man. Saint Germain, then, gives us the way of self-transformation through intense invocation of the sacred fires of the Holy Spirit as that violet flame action that is the dissolving of sin or the records of past karma. Could we spend a little more time looking at one of the Masters in particular? Which one would you like to look at? Well, El Morya begins at the beginning on the First Ray. He teaches that without dedication to the will of God you cannot be disciplined on any other of the rays. And so Morya takes on those individuals who have perhaps rebelled against their inner calling and who are not really following the Master of their ray because they have not yet come to grips with their own relationship to the will of God. 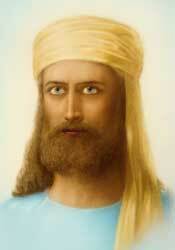 The most important lesson that I have learned from El Morya is that the will of God is within us. It is our inner blueprint; it is the design of the soul. To rebel against the will of God, then, is to rebel against the Self, the true self. Jesus teaches us that a house divided against itself cannot stand. And so to begin the path of true chelaship we have to resolve this schism within the self. We have to realize that the will of God is good and it will not take from us our essential oneness or our true identity but it is the adornment of that reality. Could you tell us something about the embodiments of El Morya? El Morya, who is so beloved of his disciples, was one who attended the birth of Jesus. He was Melchior, one of the three wise men. In the sixth century he was embodied as Arthur, King of the Britons. Our hero of this age, if we ever had a hero, would be King Arthur. And if we would ever want to go back in history, I think we would all like to be at Camelot. It was the dream of our late President Kennedy. And we find that it is the real flame, the real, jeweled love quality of El Morya, who is very present with us today, that makes us hark back to this great visionary king who founded the order of the Knights of the Round Table and led his knights in the quest for the Holy Grail, from which Jesus drank at the Last Supper. This Holy Grail was brought from the Holy Land by Joseph of Arimathea and buried in a well at Glastonbury. And so the focal point was set for the dispensation of Camelot. Morya was also Thomas á Becket, Chancellor of England and Archbishop of Canterbury under Henry II. In the fifteenth century he took embodiment as Sir Thomas More, who wrote Utopia, in which he outlined the ideal community, the ideal God-government, and who, under Henry VIII, was the Lord Chancellor of England. When he refused to take the oath repudiating the pope's authority or to uphold Henry VIII's divorce from Catherine of Aragon, he was sentenced to death. Thomas More was canonized in 1935. Many remember him as the great heroic figure portrayed in the Man for All Seasons—the same Arthur come again, the same soul.